Google, the massive search engine company, smartphone operating system creator, and laptop maker, unveiled their newest plans to take over the world during the Google I/O event last year. It was called “Project Glass”, and recently we’ve been given a glimpse into the proposed uses of Glass. Basically, Project Glass consisted of a thin and lightweight pair of clear glasses with a computer built into them. The device would tether to a smartphone via Bluetooth connection, and stream your text messages, phone calls, pictures and videos, etc to your eyes. It’s called “Augmented Reality”, and it’s going to be the next big thing in the mobile world. With Glass, users can get real-time streaming information about the world around them. If you’re visiting a historic landmark, Glass will show you information about it. Maybe you want to take a picture of the site, you simply say, “Ok Glass, take a picture”, and the onboard camera will snap a quick photo. You can then share the picture to your Google Plus account, or text it to a few friends. Google is about to make the world a much more open place yet again. Their Android operating system has already changed technology in ways never thought possible. The sky is the limit when Glass finally debuts for public consumption. This fall, they’re letting 8,000 lucky customers purchase a pair for Beta testing. 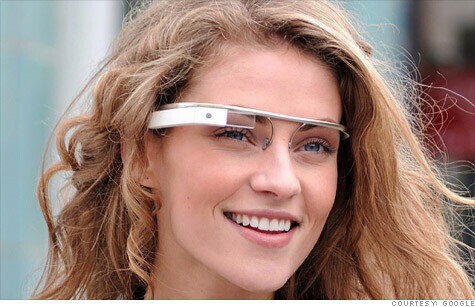 Google is expected to release Glass for wide distribution next spring. Price: Unknown. On top of being a revolutionary piece of technology, Glass will go a long way towards making the planet more eco-friendly. The miniscule size of the Glass computer chip will help reduce electronics to the point where we consume less and less each year in product materials. The smarter our technology becomes, the more our planet benefits.